Age of Wonders was one of the earlier “spiritual successors” of Master of Magic, if I remember correctly. It had magic and heroes, units, tactical combat, a fantastic world and fun spells. It also had scenarios and a campaign. I remember it being far to difficult for me as a kid. After reading a Let’s Play on Something Awful, I got an itch and bought it on GOG. First off, I know Icewind Dale is still a work in progress, but the save is stuck on a computer I don’t have access to right now, so I can’t play it. 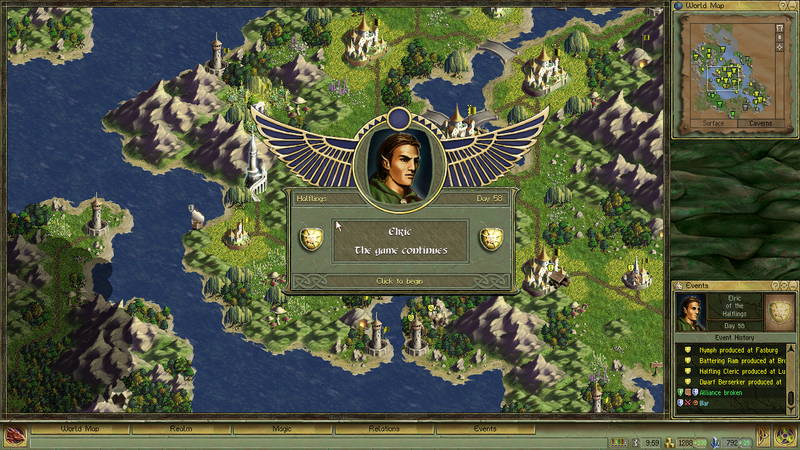 NOTE: I started playing Age of Wonders during my Christmas break, on the 24th of December. 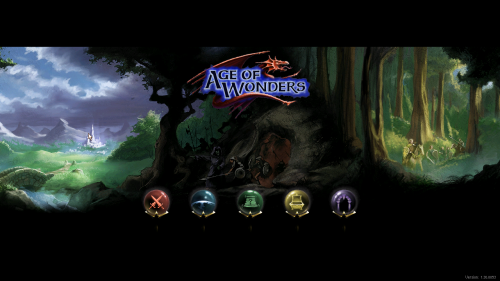 I love 4x games and Age of Wonders is sort of a 4x game. My problem with these games, though, is that I play them as sandbox city builders, where there is never any danger. However, there’s danger in Age of Wonders, A LOT of it. I started playing the campaign after completely skipping the tutorial. It’s an interesting campaign where you can play as one of two sides and the story further branches out every few levels. You start by leading the race of halflings, which is cool all on itself, since you hardly ever see them in fantasy games, especially as protagonists. The title screen actually scales quite nicely with the resolution. I played through the first level relatively easily, but even then, I managed to lose once. You’re supposed to defeat the goblins and start out on a relatively defensible position. However, you get lulled into a false sense of security quickly. The AI tends to exploit holes in your defense quite effectively. It attacks smaller armies it can easily defeat, conquers undefended cities, even razing them if there’s a high chance of you liberating them, and it even does the lame thing of sending flying units into the back of your empire to get your strongest cities while you’re not being careful. Most of that didn’t happen on the first level, though. Instead, I captured the cities on my part of the map, moved on to attack one of the larger enemy cities and then got my hero killed, which is an automatic loss. 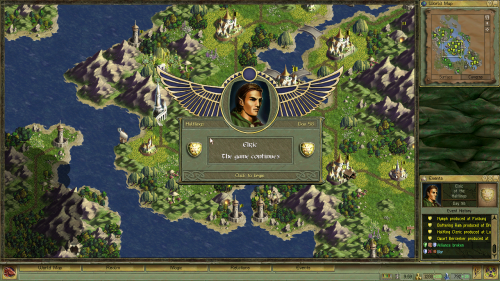 As I said, Age of Wonders has a campaign. As far as I can tell, there is no classic random map that most other 4X games have. There’s no winning through diplomacy, culture, science or conquest. Instead, each campaign map and scenario have their own winning conditions such as conquer everything, reach a certain area in a certain time limit, liberate a city, or anything of the sort. The town screen is less interesting than in Master of Magic. 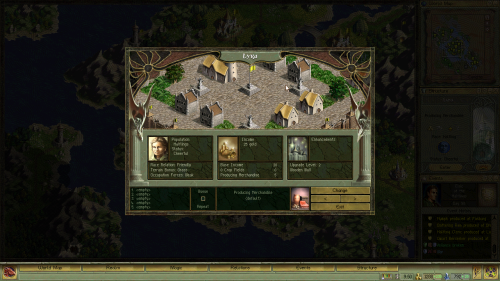 Level 2, for instance, had the objective of reaching a town on the far side of the map within 20 days, which translates to 20 turns. This was the source of my second game over screen. I did read through the mission objectives at the start, but instantly forgot about them as the game started, focusing on strengthening my kingdom before advancing, which netted me the defeat screen before I even got out of the first area properly. On my second go, I just rushed through it all and even so, it was a narrow victory, with my turn limit almost running out. On the other hand, the third map was pretty much a conquest victory objective. I started out on my own island, with an elven ally to the south and started fighting orcs towards the central island, which contained a large halfling city. Once I was done with the orcs, I needed to also defeat the goblins and finally the frostlings. The game map looks great and feels great. This is the central town of mission 3. The thing about that was that there also seemed to be some diplomacy. 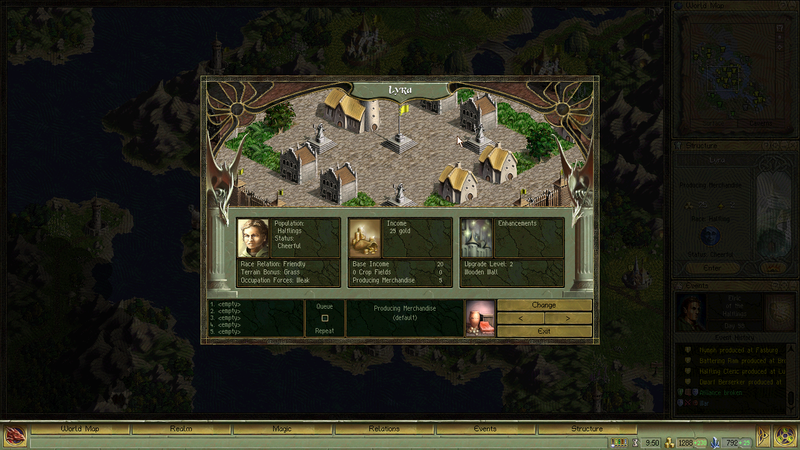 The elves were allied with the frostlings throughout, but I entered war with them only later in the mission. It also seemed like there was a chance to make peace with them, but I wasn’t able to do it. I’m not sure, though. Early on, the enemy did that annoying thing of sending a few air units into the back of my empire. It razed a large city, and a tower and took another smaller city and a shipyard with 3 flying units. I was far away from that, so I wasn’t able to defend properly, but luckily, the major part of the orc military was focusing on the elves, so I was able to stay alive and rebuild later. From what I can tell, there isn’t any city building. Each city is on a fixed location on the map. Some can be upgraded to allow for stronger units and more income, but the level they can be upgraded to is also fixed. 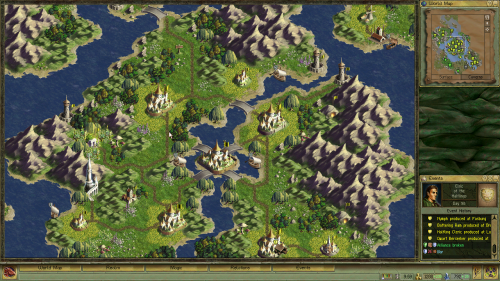 Each city also starts out belonging to a certain race, but you can migrate to a different race by spending a few turns. This is actually recommended, because cities tend to revolt back to neutral if they belong to a race at war with yours. What’s worse, or better, depending on the perspective, if a neutral city belongs to your race, you can simply pay them to have them join you, in which case you get the defending troops added to your army. Scenarios are on-off maps where you get slightly more options. Even further, if you leave units of an enemy race without loyal leadership, they also tend to revolt to neutral, wandering the map and even conquering undefended cities. Overall, it seems my best bet was to leave a loyal unit or two in every city I capture and immediately migrate them to one of the races friendly towards me, which are halflings, dwarves and elves up to this point. 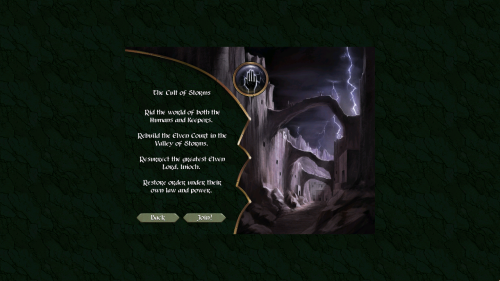 The first choice I had was to pick between the two major sides in the campaign – regular elves and dark elves. Then there was another choice between helping and leading the halflings and something else I’m not quite sure of. After the third level, I am now able to decide between helping dwarves, who got attacked and are now basically refugees, and allying myself with the lizardmen. I decided to pick the dwarves, because I prefer working with classics. With each level, you get to pick improvements to a hero, such as basic stat growth or even learning new abilities. You are allowed 10 points, with straight stat upgrades costing 5 points per stat and skills ranging from 5 to 20 points, meaning these points can be saved and transferred to the next level. The skills aren’t very interesting, but compared to Master of Magic, which has a similar spectrum of skills and abilities, this is an improvement because there is at least a choice in the matter. 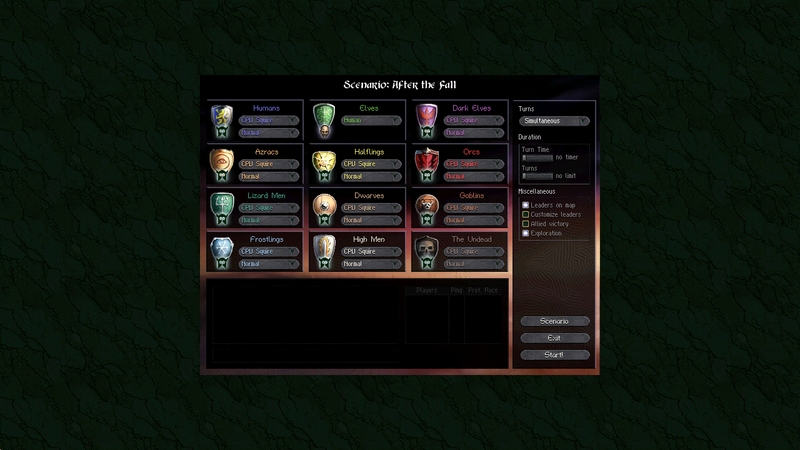 For now, I developed both the starting hero and the one I recruited in the second mission into spellcasters, with the goal of eventually giving each of them an army to control. You’d think I’d remember the protagonists name by now, but I didn’t. After every mission, you get to decide what to bring with you to the next mission. There’s a limited amount of points to budget from, with each unit, hero or item having a point cost depending on the power of that item or unit. Mostly, I leave the items behind because all of them simply provided small stat bonuses. Instead, I take the hero with me, as well as several of the higher leveled units. The problem with that is that if you take an orc unit with you, for instance, there’s a high chance it will desert and attack you as soon as the map is loaded. I expect the campaign to be quite long. The first two missions were relatively short, but the third took up a large part of my day. Though there is no typical 4X random map, each of these missions can easily feel like one. For such an old game, it looks very pretty and has excellent support of wide screen and higher resolutions. I had no problems running it in any resolution I like as well as in windowed mode. You can even manually resize the window in any way you please and it looks great. The two sides in the campaign are polar opposites. There’s this strange simultaneous turn mechanic that’s on by default. With this, the enemy takes their turn at the same time as you do yours, so if you’re quick, you’re able to react before the enemy does their thing. In practice, the enemy is usually quicker, though. I’d prefer to disable it now, but it seems you only get to pick at the start of the campaign. I never actually played Age of Wonders before. My experience is strictly limited to a RIP of Age of Wonders II I once had. I’d like to play through all three of these games, though, since there’s a third one announced, apparently. Confused? Right now, there’s Age of Wonders, followed by Age of Wonders II, followed by Age of Wonders: Shadow Magic. Recently, Age of Wonders III was announced. In any case, I’m very much enjoying my time with Age of Wonders. It’s challenging, but rewarding.